The Pz.Kpfw. III Ausf. E is a German tier 3 light tank. An order for designing a 15-ton tracked vehicle with a gun armament was placed in 1935. Despite the weight of the Pz. Kpfw. III Ausf. E, the first large-scale vehicle, reached 19.5 tons, its configuration was deemed successful, and the number of vehicles eventually grew to 96. Further modifications became even more popular, and the Pz. Kpfw. 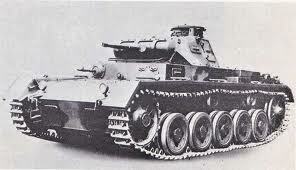 III became the most mass-produced vehicle of the Wehrmacht. The Pz.Kpfw. III Ausf. 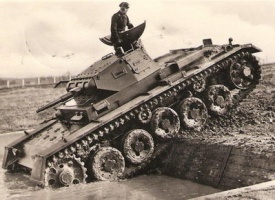 E leads to the Durchbruchswagen 2, the Pz.Kpfw. III Ausf. J, and the Pz.Kpfw. IV Ausf. A. The Pz.Kpfw. III Ausf. E boasts an excellent top speed and maneuverability. It excels in the scout role, and after learning the ropes in tiers 1 and 2, players should find this to be an enjoyable next step. After receiving a HD model in patch 9.16, the Pz.Kpfw. III Ausf. E (formerly Ausf. A) is now slightly taller, but with better hull armor. 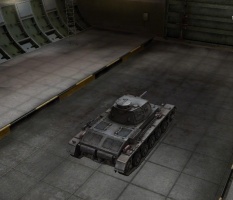 It's hull and turret armor is 30mm all-round (except for the rear of the hull), which is effective against machine guns and low tier opponents. It does have drawbacks, like the stock gun which is not much more powerful than those found on the previous two tiers. 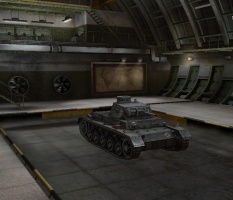 However, once fully upgraded, it is more than a match for the equivalent Soviet and American tanks. It also excels in an anti-scout role such as taking down faster tanks such as the BT-7 that it can penetrate consistently. To make up for the longer aim time, it can take up a "scout-sniper" role in that it can first rush ahead to spot the enemies, and as soon as it makes first contact with the enemy it can then escape with its good speed and then take up a better sniping position to take out the arriving enemies. 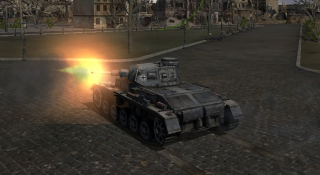 The gun can and will absolutely decimate hordes of enemies unaware of the tanks position and will rarely need to be well aimed considering the 5cm gun used. Prioritize the 2nd turret which must be mounted before next mounting the 5cm top gun. Tracks next followed by the 2nd and 3rd engines. 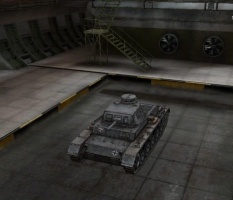 Last, but not least, research and mount the Tier-8 radio for great signal range if not carried over from the Pz.II. PzKpfw III Ausf.A in battle. During the mid-1930s, and after gaining an experienced taste from the Spanish Civil War of how warfare would be fought in the coming decades, the Wehrmacht began developing a new armored doctrine based on the lightning fast application of force in combined arms operations. Under General Heinz Guderian, a project was commenced to solicit designs for two new types of tank. One would be a support tank and would be armed with a large caliber gun. The other would be mounting an anti-tank gun and 2 machine guns. 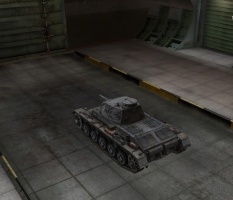 The former would become the Pz.Kpfw. IV. The latter would become the Pz.Kpfw. III. Late in 1935, development proposals were requested from MAN (Nurnberg), Daimler-Benz AG (Berlin-Marienfelde), Rheinmetall-Borsig (Berlin), and Krupp AG (Essen) for a 15-ton fully-tracked vehicle, and in the interest of security to be named Zugfuhrerwagen (ZW): platoon commander’s vehicle. The vehicle's development began with a series of arguments between the Waffenamt (the Ordnance Department) and the Inspector for Mechanized Troops over its armament. The Waffenamt had chosen the 3.7cm cannon while the Inspector for Mechanized Troops demanded 5cm gun. Ultimately, the 3.7cm was chosen as the vehicle's main armament because the infantry was already equipped with the standard 37mm Pak 35/36 L/45 anti-tank gun. This meant that only one type of gun and ammunition needed to be produced, although the turret and turret ring were capable of mounting the heavier 5cm gun. 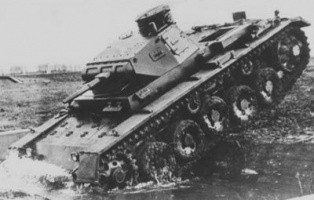 Since this new vehicle was to be used in the forward echelons of assault tank formations, it was decided to require heavier armor in the front than in the rear. Top speed was specified to be 40km with a crew of 5 men, with a new turret based on an enlarged version of that found on the Pz.Kpfw. II. The Pz.Kpfw. III Ausf. A was the first German Tank to use a new intercom system for in-tank communications, which was fitted to all later Panzer tanks, and was highly successful. Eventually, the Daimler-Benz design was selected and ten prototypes were constructed in 1937. Some sources state that as many as fifteen were constructed, but only eight were armed. These eight equipped units of the 1st, 2nd, and 3rd Panzer Divisions and took part in Anschluss, the take-over of Sudetenland and the Polish Campaign. The Pz.Kpfw. III Ausf. E was the first dramatic change to the tank's design. The tank's suspension was redesigned from leaf-springs to torsion-bars, and now had six roadwheels per side instead of five. The armor was also upgraded from 15mm of armor on all sides to 30mm of armor on all sides. This page was last modified on 18 July 2018, at 05:34. This page has been accessed 267,389 times.